Well, moving back to Canada, settling down, and starting a new job have taken their toll, but given my past posts (see here and here) on this issue, I wanted to say a few words about Bill C-20. 1. Current law: divide 279 seats proportionally among the 10 provinces, and then make sure no province loses seats. 2. My proposal: make the size of the House such that Québec is proportionally represented with 75 seats. 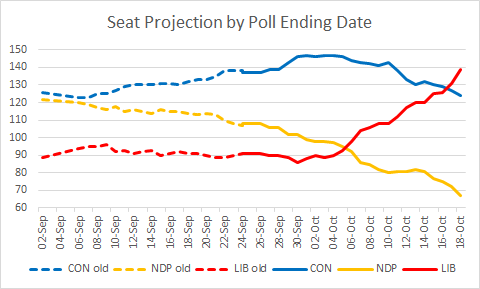 Divide the remaining seats proportionally among provinces other than Québec. Then make sure no province loses seats, and divide the remaining seats proportionally among the remaining provinces. Iterate until no province loses seats. 3. 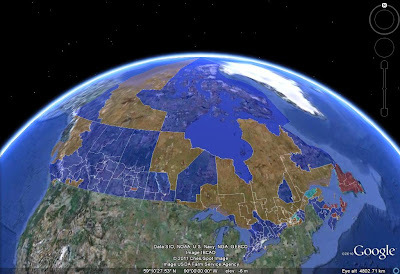 Second* Tory proposal: Québec gets 75 seats, and every province gets seats in proportion. Then make sure no province loses seats. 4. Third Tory proposal: each province's number of seats is its population divided by the electoral quotient, but no province loses seats. The electoral quotient is 108,000, and then increases with the 10-province population growth. 5. Current Tory proposal (C-20): each province's number of seats is its population divided by the electoral quotient. The electoral quotient is 111,166, and then increases with average of the population growth in each of the 10 provinces. Then make sure no province loses seats. Then add seats to Québec such that it is not underrepresented relative to its share of the 10-province population. The first 4 schemes use raw census counts. C-20, however, uses population estimates based on census counts. The advantage is that this corrects for some people not counted by the census. The disadvantage is that figuring out how many people the census missed is somewhat arbitrary, so whoever comes up with those estimates (Statistics Canada bureaucrats, perhaps under pressure by the government) has the power to influence the number of seats. *If you remember, the first Tory proposal sought to disadvantage Ontario with respect to Alberta and BC due to Ontario being a "large" province. Obviously, that went nowhere. - All of the following are estimates, based on current population estimates for July 1, 2011 (which haven't yet incorporated 2011 census data), and on the 2006 census' estimated undercounts. - Under all proposals, provinces and territories other than BC, AB, ON and QC keep their current seat count, for a combined 63 seats. - Under C-20, relative to current law, the House expands by 25 extra seats. Over half of that gain (13) goes to Ontario, with 5 accruing to BC, 4 to AB and 3 to QC. 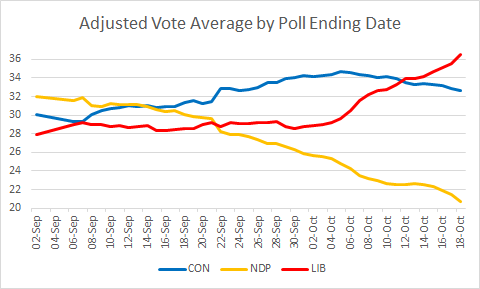 - Under C-20, Alberta could very possibly end up with 35 seats, while BC and ON may well end up with just 41 and 120 seats respectively - this will depend on how the census plays out. - Under C-20, relative to the previous Tory proposal, Québec obviously gains, but not all other provinces lose. Indeed, the change is roughly neutral for Ontario and Alberta, at least if census undercoverage remains similar as in 2006: it was around 4% in ON and AB, but just 3% in Canada as a whole. Thus, using population estimates rather than census counts gives Ontario 1-2 extra seats, and pushes Alberta closer to that 35th seat. This roughly compensates for the slightly larger size of the House. - C-20 is a little worse than my proposal for Québec even though both seek to make its seat share equal to its population share. The reason is that census undercoverage tends to be lower in Québec - just 1-2% in 2006 - so using raw census data would give Québec a higher share than using population estimates. This is, of course, just a measurement issue, and in principle, C-20 treats Québec in the same way as my plan, so I view it as fair. Props to the government on that. - Overall, I'm ambivalent towards the main difference between C-20 and my plan: the size of the House. On the one hand, C-20 makes it quite a bit bigger, with all the associated expenses. On the other hand, given that the 6 small provinces' seat numbers are fixed, the only way to reduce their overrepresentation is to have more MPs. I think I'd be willing to swallow the pill if future growth in the House size were controlled under C-20. Is it the case? All five plans have the following common-sense feature: the size of the House doesn't change if all provinces grow at the same rate. But this condition is far from holding in Canada! In each plan, the House grows if historical trends continue. 1. Current law: the rate of expansion of the House depends on the difference between BC, AB and ON's population growth rate and the 10-province population growth rate. 6-7 seats in the past two redistributions, and would probably have been 5-7 this time. 2. My proposal: the rate of expansion of the House depends on the difference between the national population growth rate and Québec's population growth rate. This difference has shrunk dramatically recently: just 0.1-0.2% per year in the past three years. That translates into a 3-to-7-seat increase in the size of the House per decade. In the late 90s, the gap was instead 0.5-0.6% per year, which would mean a 16-to-20-seat increase per decade. 4. Third Tory proposal: essentially the same as current law. 5. Bill C-20: the rate of expansion of the House depends on the difference between BC, AB and ON's population growth rate and the average of the population growth rates of the 10 provinces. The latter is likely to be significantly lower than the 10-province population growth rate because smaller provinces send to grow slower. As a result, the House would grow more quickly under Bill C-20 than under current law or the previous Tory plan. This discrepancy was only about 0.1% in the past three years because of healthy growth rates in SK, MB and PEI, but it was 0.4% as recently as in 2007, and 0.5% from 1991 to 2001. Since BC, AB and ON would have about 60% of seats, Bill C-20 is likely to increase the House size 0.7-3% per decade more quickly than current law. This would mean a total increase of 7 to 18 seats per decade, about the same as under plans 2 and 3 above.